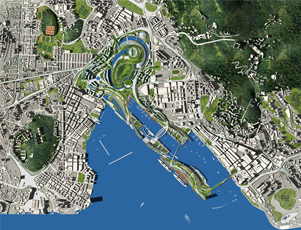 South East Kowloon Development Statement Study comprises one of the largest, most challenging urban redevelopment sites in the world. It is an area of 600 acres in the heart of Hong Kong, including the former airport at Kai Tak, surrounding old urban areas, and an area of Kowloon Bay suitable for reclamation. SQW were commissioned as part of a consortium led by Llewelyn Weeks Planning to prepare a Outline Master Development Plan for the entire area, covering urban form and structure for the new development areas, redevelopment and upgrading proposals for the old urban areas institutional mechanisms for implementation, economic impact and financial aspects of the study, including development and use of detailed elevation criteria to test and refine options against financial, economic, physical and environmental objectives. We also contributed substantially to planning the overall concept for the area and to specific development proposals.